At Caron Chiropractic Clinic, P.A. we see you as an individual with a unique set of needs; and we see chiropractic as a system of health care that is different than medical care alone. Without drugs or surgery, chiropractic health care helps retrain your body to take care of itself. If your bodily structure is unbalanced or is not straight and true, you may feel pain, become ill or tire more easily. As a Minnesota Chiropractor, we provide an integrated approach to your therapy needs. We believe Chiropractic Care is an important aspect of caring for many spinal problems, but we also know the importance of adding the expertise of physical therapy, massage and exercise for a complete program. In addition to having massage therapy available, we also have a Rehab Facility on premise to assist patients with a variety of exercise and rehab solutions. We believe health is the natural state of your body, so let our friendly and experienced team help you start enjoying more of life with less pain and more vitality, naturally! 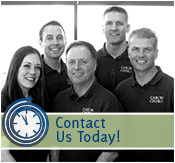 Contact us today for an appointment at either our St. Paul or North Oaks Chiropractic Clinic. Whether you are looking for a St Paul Minnesota Chiropractor or a North Oaks MN Chiropractor we are conveniently located in both cities.